Welcome to Your Brain and You! The book is now available on Amazon for just $9.95. A brief description appears below. Comments and questions about what’s in the book are welcome! Please see “Leave a comment” box below. I will do my best to respond to all questions and critical comments. Please visit the blog. It will be about topics related to what’s in the book. The things that make you you – your thoughts and feelings, your hopes, your sense of self – depend on the workings of your brain. But you don’t control these workings: in everyday life, you don’t know what your brain is doing, and you don’t find out what you’re going to think until your brain has made you think it. When our brains give us thoughts like these, puzzlement and anxiety are likely to result. 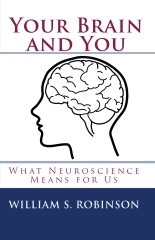 In Your Brain and You: What Neuroscience Means for Us, I clarify and solve several puzzles about how to think of ourselves in light of what we have learned from neuroscience. I talk about anxieties concerning selfhood and moral responsibility, and I explain a set of attitudes toward ourselves that fit with both common sense and the scientific view of what we are. I avoid technical jargon and make important issues accessible to a general audience. Thought you’d like to see this. It’s an 84″ X 43″ X 6″ back-lit exhibit. When an accompanying 3-dimensional model brain is touched, that location is simultaneously illuminated on the illustrated brain as well as the word describing the activity controlled by that area. Looking forward to reading more entries in your blog!